We found our gorgeous Splash Marans had died today. She was suffering with respiratory disease. She was doing well so we were quite shocked to find her laid on her side at nightfall. She raised a clutch of Ayam Cemani's this year - she did us proud. We will miss you, Florence! We got Florence (a barred sizzle) as a surprise from a local chicken owner who traded us for a rooster we couldn't have in the city. She was the only bantam in our group of 12. We have only had chickens for 7 months and she is our first loss. She was the favorite of our group. She was super sweet and did so well with the children. I noticed she was acting off this morning and wouldn't come out of the coop. 2 hours later she was gone. My 6 year old and 4 year old will be devastated. Thank you for the few short months we had together Florence. You will be missed. I would just like to pay tribute to the chickens we have lost. We miss you: Sweetie, Lizzie, La Petite Peep, Hasty, Fiesty, Henrietta, and Little Dorrit. And also to the chicks that died en route. Coco (a RIR) was with us for about 8months from birth. Fabulous hen, great layer, jumped on my daughters shoulder and sit with her. We would call her and she would come running to us. Best girl ever. Then last week walking up to feed her she was laying, dead, so upsetting. No signs of any attack what so ever, we have no idea, maybe a snake bite but thats all we can think of. She had a great life with us and bought us so much joy. Sudden chicken death is so upsetting, Allison. There seems to neither rhyme nor reason to it. One minute we have a healthy hen, the next she has passed away. 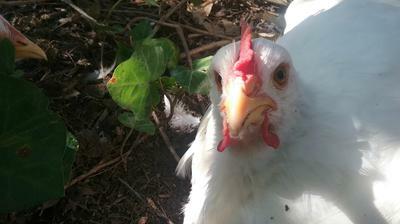 Meet Popcorn, our beloved pet chicken. 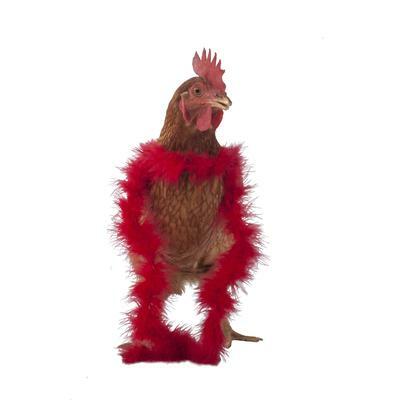 Popcorn was a free ranged chicken (and sometimes a freelance model) who was full of personality! She loved grapes, hotdogs, and especially meal worms. Being inside the house was her favorite place to be. She would wait by the door and sneak in on a regular basis. Getting in the car was also good fun as far as she was concerned. She would follow me wherever I went and would come running when called. She was truly amazing and will be missed by us all! Wow! What an adventurous chicken Popcorn was, Billie! I'm so glad you introduced us, and so sad for your loss. Chickadee was one of the first chicks I ever bought. She was very loved. My children could carry her all around the farm and she followed me everywhere. She was found today on the coop floor in eternal sleep. She will be missed terribly. Kate (brown) and Alice with forget-me-nots. Never forgotten. Kate was always the bottom of the pecking order but soft and loving. She was always keen to get to bed at night, waiting on the steps for others to go before her and take her turn. And always first to get to the food at the morning. She loved snails and worms. She died suddenly today. No obvious reason. Just one of those things. But a sad day all the same. Sudden death syndrome kills again . 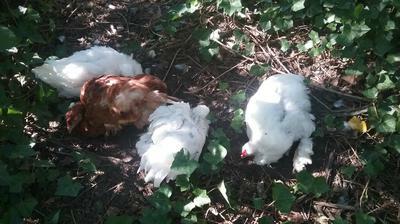 I found it (what it looked like) asleep in a twisted position while all the other chickens looked on helplessly. However once I had prodded her, I realised she was indeed dead. I had 8 chickens in a large pen with a large protected field to roam. Now I only have 7. I used to have 3 White Cochins (2 hens, 1 rooster) and one Rhode Island Red. I loved them all, for the 8 months that I had them. My chickens were happy, healthy, loving birds. Unfortunately, in September of 2016, a coyote broke through the wire fence and killed my brave little girls. Chumlee, my favorite hen was still completely intact, while my other girls, Fuzzy and Fluffs were missing their heads. It was terrible when I opened the coop in the morning to find my pets, a putrid, bloody mess, on the floor. I will be getting new ones in the spring, same breed but different color (going for partridge this time) and a little less generic names. 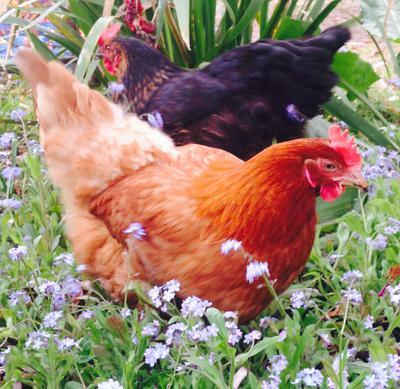 I will name the new flock of 3 hens, Basil, Clover and Primrose. More naturalistic names. You're probably wondering how the rooster I mentioned earlier is still alive. He escaped the carnage by luck and coincidence. His crow became too loud for where we live, and bothered the neighbors, so we gave him to a friend of ours who lives out in the country. He left a week before my flock was killed. We visit him often. Gray Girl, our Lavender Wyandotte, died this gray, rainy December day. She had been fine until yesterday, when I noticed that she was hanging alone, head pulled in tight to her body, and not following our rooster, Doodle, like she normally did. Last night I put her in the heated shed rather than try and get her in the coop with the others. She didn't touch her favorite treat, meal worms, or water and this morning when I went to check on her, she was dead. We had her for 4 years and she was the quietest of our flock, never leaving Doodle even when the other hens were off foraging in the yard. My wife is crying and I'm about to. 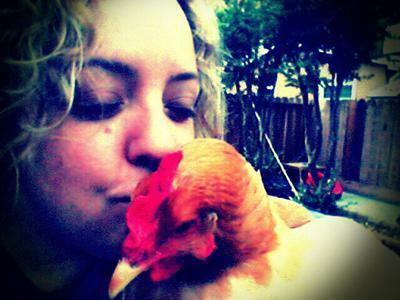 It's hard to believe you can get so attached to a chicken when you have a dog, 4 cats, and honeybees to look after, too. We'll miss you Gray Girl. RIP. My lucky hen was adopted from a neighbor; she was from the same family as my silver laced Wyandotte, so when he stopped feeding his hens, I took them happily! 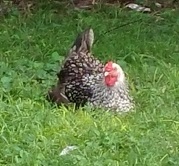 Frenchy was calm hen who did raise too much cain and happily pecked around the yard, laying eggs everyday. Yesterday was hot, and even with all the water out in the yard, she didn't make it through the night. She was our only other SLW hen, and I miss her already. She was always nicer to the smaller birds in the flock. We have a smaller flock of only 16, then 15 as we lost our "Spots" earlier this year too, now 14. I am happy to have 14 happy hens, but this is our second sudden death this year, even tho months apart, and it makes it extra hard. Frenchy and Spots were both adopted from the same neighbor's flock, so maybe it was all that stress inflicted by the previous owner that finally took its toll on her little body. She was a lucky hen, beautiful in posture, character and soul. I will adopt another hen in her memory. I have never had chickens before and I had a friend that wanted to give me a chicken because her other chickens were picking on her. After a couple weeks of thinking about it I said yes and that was all it took. I fell in love instantly...She was the neatest thing. I was not prepared to have a chicken but I made sure I did my best until I did make the right environment for her. I kept her in my bathroom the first couple of days so we got to bond really fast. I let her roam the house to the door and go outside. She would sit and watch TV on rainy days. I had a diaper on her when she was inside. She loved attention and she was a pizza thief, lightning fast. She even sat still and was curious when I painted her toenails pink. She hated when someone would sneeze and let you know about it. It wasn't much longer and I had her a diva apartment..lol.. I was so excited when she laid her first egg for me. We were pals..I bought some more chickens and she started to roam with the hennys. She even had a rooster buddy - they were inseparable, his name is Handsome. He is a gentle giant. He does not like being touched but will eat out of your hand. One day when I was giving them their morning treat she was there waiting her turn. I went to town and came back and she was gone. No evidence left behind. I live in the country and I have woods all around my house. I searched for her for 4 hours tromping through the woods sick to my stomach. I never found her. In great sadness I went back to the house and sat on the steps. Handsome came up and stood in between my legs and hung his head. Oh man did this tear me up... He was in mourning like I was - enough to let me pet him. We had a chicken die today from (we're guessing) the extreme heat which caused her some stress. Even though there is plenty of shade, water, dirt to dig in etc. the heat can be terrible. We lost our pretty red hen, Ginger today. We have a buff Orptington setter, who has hatched us out 2 clutches of surrogate chicks. Ginger was in her first clutch. She was a very quiet and sweet bird who was in the middle of the pecking order. She was an interesting bird who had a song for every time she laid an egg. She was a very proud layer and very sweet to my two girls. Today, Ginger laid an odd shaped egg and then went into the leafy vines to lay down. My daughter went out later to check on the chickens and found it odd that Ginger was not moving from her spot. She picked her up and realized that she was dead. We were happy that it wasn't a bleeding death--there was no blood, no peck marks, her eyes and comb were still there. We were also happy that it wasn't a predator such as a fox, coyote, or hawk. We are will be replacing her absence with another hen, but we will never have another Ginger. Many of you may think this is just silly but I'm pretty sure our hen, Nubby is gone. A little history... I hatched her 5 years ago; her toes got frostbite 4 years ago after roosting on a metal pole in the rafters of our barn. Her toes fell off and I nursed her back to health in our basement. The following winter, 3 years ago, she did it again...the rest of her feet got frostbite after again roosting in the rafters (making it impossible to get to her). The rest of her feet fell off and I nursed her back to health again in our basement. In turn she had nubs for feet, giving her the name Nubby, nicknames Nubs and Nubbers. Every winter since, she's rested easy in our basement; she's our only chicken that's lived in our basement during the winter. 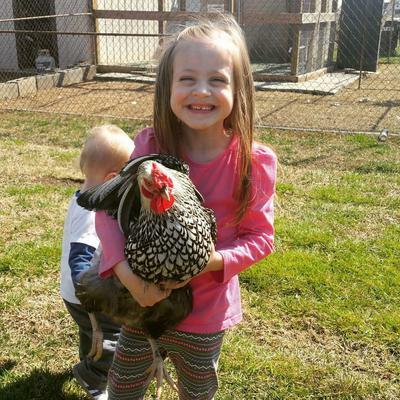 She laid my husband's favorite eggs to cook in the mornings and our family loved that hen like a true pet. Nubbers had her own run so the other hens wouldn't peck at her, she had her own house, and she's the only one we let out to roam during the day to graze the grass. Our cats even loved her and would hang out with her during the day. Last night, my husband's parents brought their dog, Oscar over for us to dog sit. Within the 15 minutes of Oscar being here he got ahold of Nubs. There wasn't feathers anywhere and she did run off but we cannot find her and it's killing my heart. It took everything I had to hold back the tears last night as my husband's parents were apologizing. My husband and I have looked everywhere, I don't understand where she could've gone. I've never cried over a chicken like I have her. It would be kind of you to say a little prayer for her to find her way home or to rest in peace. She will be missed so very much. 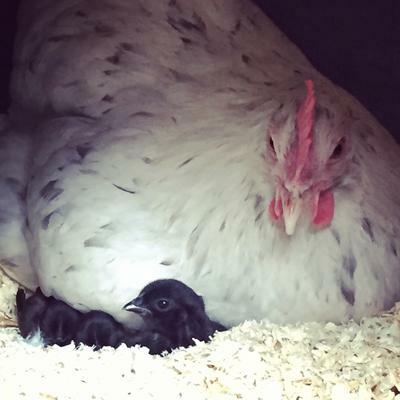 When we got chickens, we never expected to hatch any. but to our surprise, exactly that happened. 8 newborns, fresh from their shelled enclosures. But as the day progressed, there were only 7. then the next day came, only 5. This was extremely upsetting. Later on, one of the baby's heads was found lying on the ground. I was heartbroken - my entire family was. The same thing kept happening, over and over again. until there were only 2. 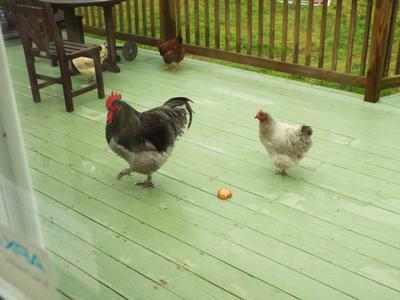 But before there were just 2 left, me and 3 others of my family were chatting, about 8 feet away from the coop. I heard a small screech, and I see 3 baby chicken bodies, lined up in front of the left side egg box on the outside of the coop. I started yelling, and searching for one baby that meant everything to me. Jilly. The reason she was so precious was because she was the one that was defective from birth. She had a limp for the longest time and I cared for her , until she was 95% healed. But she never made that last 5%. She died, along with her 5 other brothers and sisters. We put the remaining 2 in a box and kept them safe. until we decided to put them outside by themselves for 1 night. The next morning, gone. No bloodshed, no feathers, nothing. Just disappeared. Almost a year had passed, and a new batch had just hatched. Same situation, a hurt and or sick baby chick was born. I cared for her, and her sister. They were twins, and they had grown together until they reached adulthood. We named one Luna, but I cant recall the other's name. Sadly, Luna's sister died from our small dog biting her. She was a loner for a long time, but she had stolen the hearts of our entire family. Except, a certain animal decided to start killing our chickens in the black of night, chasing them down till they died. And when we found her feathers all over the yard, our family's hearts sank. Everyone was devastated. We buried her under a tree, just down the street. Since then, we kept extra close watch of all our beloved chickens. We will miss all of you. You were a big part of our family. When I went to pick up my six pullets, they were only 5 days old. I'd had my heart set on Wyandottes. I'd done all the research to make sure they were the perfect breed for my first backyard flock. When I arrived at the farm the woman informed me that there had been a mix up when she had received them and banded them. She had banded them as Wyandottes but was now unsure of their breeds. I didn't care. I was so excited I decided it would be interesting to see what they grew into. This was July 1, 2015. In February 2016 I lost my first girl, Num Nums, to a dog attack. It was our new dog we had just rescued two weeks earlier. My toddler wanted to collect eggs and decided to help himself to the coop while I was going potty. Num Nums never stood a chance. She was the biggest in the flock. A dual purpose I believe. I was devastated. Inconsolable. She was starting to come around and enjoying her pets. She suffered. I know she did and I wish everyday that I could have eased her pain. In April I had to cull my first chicken. My girl Emmaline started to look pale. I couldn't find a vet to see her until Monday and this was a Friday. I brought her inside and made her comfortable. I scored some antibiotics and began her on those. On Monday she saw the vet and received fluids and a different antibiotic. The vet said she felt a lump in her abdomen. By Wednesday she was so weak that she couldn't stand. I culled her that afternoon. She was the lap chicken of the flock. Always looking for treats and pets. So docile and sweet. At the end of May we moved to temporary housing that didn't allow chickens so the remaining four went to stay on a family member's farm. The introduction to their flock went well. There was some challenging but nothing big. I called and checked on them the next day and was told the challenges had ceased and everyone was doing well. Two days ago (June 11) I called to check on them again and was informed that my favorite chicken, Ceviche, had died the day after my first phone call. The family member doesn't know why. No signs of trauma. Checked on them at two and by four she was dead. Sudden death syndrome? I don't know. I would've done a necropsy but the family member didn't want to tell me. She knew I'd be upset. Ceviche always hopped up on my shoulder when I would go sit in the coop. She'd fall asleep in my lap. She loved kisses. So there you have it. I've lost three girls in four months. Devastating. I had been thinking about getting some chooks for a few years, but was wondering how my dog Buddy would be around them when I was not there to supervise. So months after, I had to send Buddy to the rainbow bridge this year following his cancer illness. I decided to buy some hens as I love chickens and needed the presence of animals around me. As much as I love my garden, it was depressingly lifeless without Buddy around. So I had an Isa Brown-Mrs Henley, a black chook - Cheeky Girl, and a white chook, Speedy G. They are all well fed and loved chooks. Attention demanding, which I often laughed about and they loved me to spend time in the garden, digging, weeding and finding slugs, snails etc. They are great company and I loved learning their individual favorite treats and watching their behaviours, so they were well monitored and fed everyday. During hot weather they were provided water with ice blocks, bowls of frozen pieces of fruit and ice and areas of shade. They had a 1.6 acres of a safe habitat of trees and vegetable gardens to run and forage. So today, I checked my girls for the second time at approx. 1400hrs and then went to meet some friends. I returned home about 4hrs later to find Cheeky girl, my black chook dead in the doorway of her shelter. She was on her side, no blood or feathers around. I felt to see if she was egg bound but couldn't feel anything. I didn't have it in me to do any further investigation. The other two were very curious and I didn't really want them around her body. I was upset and sad as I didn't know what she died of or if she died in distress (the way I found her suggests she wasn't distressed). So, with a heavy heart and two curious chook mates who were following my every move, we buried Cheeky Girl in the garden where she loved spending time with her house mates and me. She had only a short time living with me, but she had a backyard my friends said is a chooks oasis and I'm often teased about spoiling my girls. She was well looked after and loved. I will always think of her as cheeky, curious and beautiful as in the sun her black feathers shone with a tinge of green. Despite the name, Jack was actually a hen. I knew nothing about raising chickens and I live in a suburban area, not a farm. One day my husband brought home two baby chicks from his friend's ranch. I had feelings of both excitement and uncertainty. We named them Jack and Sally (after the characters of Tim Burton's A Nightmare Before Christmas). I wasn't even sure if they were male or female. After a couple of weeks of researching care and giving lots of attention/love, poor Sally was killed by a neighborhood cat. My husband came home from work (swing shift) and heard frantic chirping. It was Jack, who seen Sally getting killed. Sally died in my hands and Jack, became very attached to us. She was our little survivor. We gave her extra love and knew that because chickens are social animals we would have to get other chickens. A few weeks later, we came home with 2 baby chicks. Our sweet Jack took good care of them, as she was the older one. The 3 of them thrived and soon we knew all of them were hens. 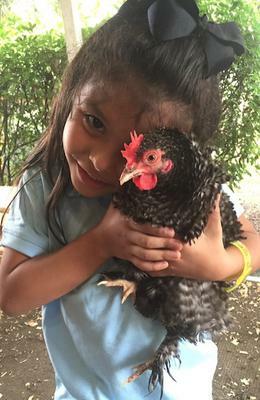 Our girls, Jack or Jacky, Goldie, and Mimis gave us delicious eggs and we even brought them to my children's school for show and tell. I loved watching them get excited for mealworm treats and feeding time. Jack died yesterday and we are devastated. She was the sweetest chicken and had unfortunately been placed at the bottom of the pecking order. have stared the grieving process. A chicken is not just a chicken.....they feel just as we do. They have personalities, just as we do. We love our beautiful Jack. Thank you so much for sharing your story of Jack, Cynthia. It's a very fitting tribute to a good hen. 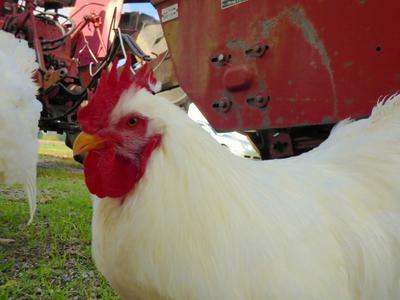 It's devastating when this happens to one of our much-loved chickens. Often the pecking order can be quite ruthless, and of course it tends to be the kindest hens who end up right at the bottom. I lost my 2 year old black and gold Easter Egger hen, Maude, today to Sudden Chicken Death Syndrome. She was happily foraging around our 1 acre yard with her flock when we had a sudden rain shower. It was short-lived, and barely got the ground wet, but all 13 of my girls ran to get under our pickup truck, as they always did when they got caught out in the rain. All was well, or so I thought. At dusk, my girls headed in to their coop. I had been working in my garden all day, so I went to close their pen and do my usual head count. I counted 12. Should have been 13. It's always 13. After 10 rounds of head counting, I went looking. I happened to walk by our truck and saw something dark laying there. I thought Maude may have just been enjoying the warm dust bath she loves, but no. She was breast down, with her wings tucked under her - dead. There had been absolutely no sign of anything bothering her. She loves to be petted and scratched, and would basically trip you if you didn't stop and give her a good scratch whenever you went outside. Today was no different. I miss her already. Yes, it happens, pets die. But usually, there are signs that tell you they need help. This is something I have never gone through with any of my animals - ever! I hope she knew she was loved and appreciated, I think she did. Forage free, Maudey, you were a good ol' hen.